4 Easy Steps to Pain Management! 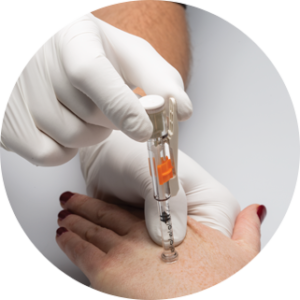 The injection site should be selected near where your patient will be receiving an IV placement or minor needle procedure. 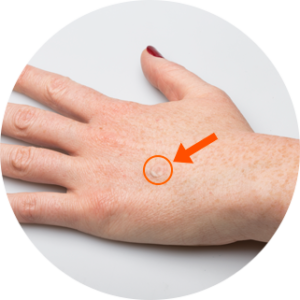 Select a location that will have the most subcutaneous space. 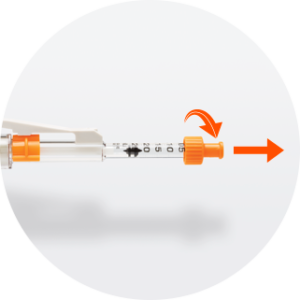 If your injection site is near a vein, we recommend using the Z-Track Method where the skin above the vein is moved to the side during the injection and allowed to return once the injection has been given. However, if the vein rolls with the skin, do not Z-track and choose an injection site to the side of the vein instead. Once the injection site has been chosen, disinfect the area allowing the disinfectant to air dry completely prior to injection. The J-Tip can be filled by a hospital’s Pharmacy Department, or 3rd party pharmacy prior to its time of use, or it can be filled at the bedside by appropriate clinical staff. If the J-Tip will be filled at the bedside or at its time of use, follow the steps below. 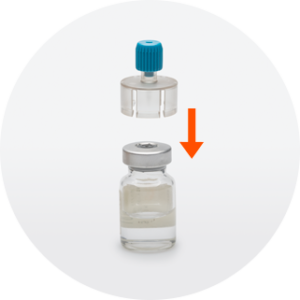 Attach a Vial Luer Adapter to medication vial. 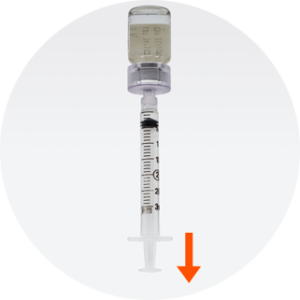 Use a standard luer lock syringe to draw the desired quantity of medication. 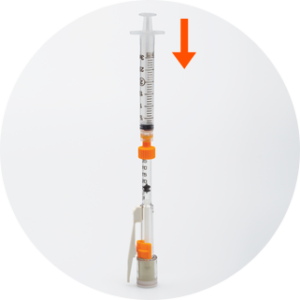 Attach luer lock syringe to J-Tip and fill the J-Tip with the desired quantity of medication. Inspect the J-Tip for damage and confirm the presence of a white End Cap, white Activation Lever, orange Safety Collar, and orange Luer Adapter or orange Sterility Cap. Do not use J-Tip if any component is missing or damaged. Remove the J-Tip’s orange Luer Adapter or orange Sterility Cap from the end of the device. Slide the orange Safety Collar forward. Hold the J-Tip at a 90° angle, pressing the end of the device firmly against the skin on the desired injection site. 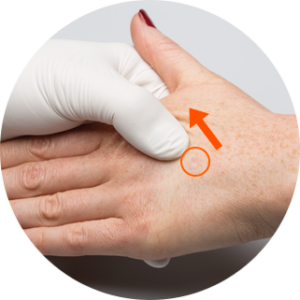 If the Z-Track method is being used, use one hand’s index finger or thumb to move the skin above the vein over to the side while holding the J-Tip in the other hand as shown below. Once you are ready to inject, squeeze the Activation Lever. You will then hear a “pop” sound which confirms the J-Tip has been activated. The medication will be injected within a fraction of a second. 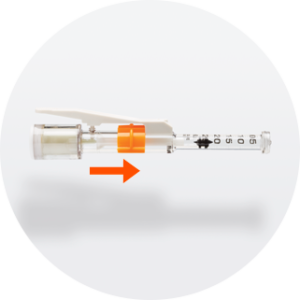 Hold the J-Tip over the injection site for an additional 2-3 seconds following its activation. 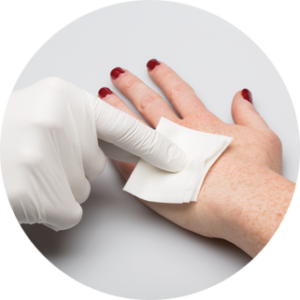 Then massage the injection site with a sterile gauze pad to help the medication disperse in a broad pattern. The J-Tip can now be discarded. The injection area will become numb within 1-2 minutes and will have effect for 15-20 minutes. We recommend the use of 1% buffered lidocaine if available or a standard preservative free lidocaine (MPF), to minimize any stinging or burning that can be associated with regular lidocaine. We recommend reading our FAQs section prior to use. The pressure used to deliver the medication is vented from the device following activation which will make a “pop” sound and should be explained to the patient prior to using the J-Tip. We like to compare the sound to the opening of a soda can. For younger and/or more anxious patients, distraction techniques can help keep the patient calm at the time of injection. The J-Tip is not fragile, but usual caution should be exercised in handling. Prior to use, do not puncture or submit the CO₂ cartridge to any undue abuse as this could cause injury. Store the J-Tip at room temperature (60-100 °F). J-Tip is not recommended for use over ports. Approach intended dose reading with care so as not to overfill, since it is not possible to withdraw fluid from the J-Tip Needle-Free Injector. Overfilled injectors should be expelled and discarded. Avoid bubbles. Care should be taken to assure that medications are free of air bubbles and are completely soluble before transferring into the J-Tip Needle-Free Injector from a pre-filled syringe. Patients receiving anticoagulants or persons with hemophilia, or other coagulation disorders may present greater incidence of post-injection bleeding and bruising. Take the same precautions as you would with needle-syringe injections and administer the appropriate treatment to minimize site reactions. Discard if package is not intact. Patients receiving chemotherapeutic agents may report increased incidents of tissue necrosis, ecchymosis, or bleeding at the injection site. 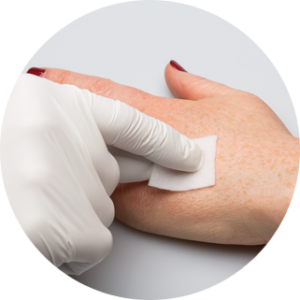 Patients who are allergic to lidocaine should not use the J-Tip.